It's not all about the chipset, Android 5.0 Lollipop is supposed to bring both performance enhancements and power savings. Denver is a 64-bit CPU core, which will enable new optimizations in ART - the new default runtime for Android that succeeds Dalvik. ART takes Dalvik bytecode and turns it into native code as the app is installed, which gives it more time for optimizations. Dalvik with JIT (introduced in Android 2.2) does this while the app is running, so it can't spend as much time on optimization. Lollipop also brings Project Volta, which adds a battery saver mode, restricting certain tasks to Wi-Fi only and batching communication to power on the radios fewer times. Battery Historian offers better tracking tools for battery usage. Anyway, the biggest user-facing change is Material Design - the new look of the stock Android interface. It's the biggest change since the flat interface of 3.0 Honeycomb that later evolved into Holo. As with all Nexus devices we're getting the undiluted experience, not Sense or any other skins. New features include a more colorful look, notification cards on the lockscreen, "heads up" notifications that pop up as they arrive and a Do-Not-Disturb feature to mute notifications. The app switcher has been redesigned as well, it now looks like a 3D rolodex and each app can have multiple entries (Chrome will use this for different tabs by default). Of course, the new squarer display of the Nexus 9 will require some involvement by developers. Apps for widescreen tablets typically have two modes - one for portrait and one for landscape orientation, which often features a split-screen UI. On a 4:3 screen orientation doesn't make much difference and it will be interesting to see how apps adapt to it. It has been a long time since a Nexus tablet went over 7" and it was about time. We appreciate what the Nexus 7 brings, its portability and accessible price tag, but we were left without a large tablet Nexus experience for two years now. HTC made it worth the wait though. The Nexus 9 design is sensible and has that premium HTC feel. It's not the thinnest and lightest tablet, but you could never stash an 8.9" tablet in a side pocket as easily as you do the Nexus 7. Still, Google made the decision to break Nexus tradition and charge a fairly high price tag. How high? The base 16GB version costs $400 and you are basically forced to pay $80 for the more sensible 32GB storage, while if you want LTE you will have to fork an additional $120. That puts it against an Apple iPad mini 3 (starts at $400), iPad Air 2 ($500), Sony Xperia Z3 Tablet Compact ($500, with microSD card slot, waterproof) and Samsung Galaxy Tab S 8.4 ($390, also has microSD card slot, 359ppi screen too). Of course, the Tegra K1 chipset is faster than all of those, aside from the iPad Air 2's A8X, and is one of the few 64-bit enabled chipsets on Android. This means it will enjoy Android 5.0 Lollipop the most. And it's pure Android to boot, with a promise you'll get the new Android version weeks, perhaps months, ahead of vendor-customized devices. You can find the 32-bit, quad-core Cortex-A15 version of the K1 chipset in the 8" NVidia Shield ($300), which also boasts things like front-facing speakers and a mostly pure Android. There's the Xiaomi Mi Pad 7.9 too, though that's hard to find in the West. It's important to remember that Nexus devices don't have to dominate the market, they just have to show the way and be there for Android purists. 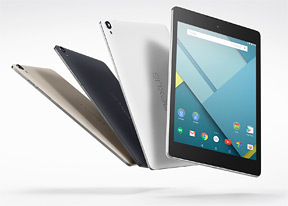 Where is the Nexus 9 leading Android tablets then? To a more premium future with intelligent, power-efficient software it seems. We can't wait to get more time with the new Nexus tablet, especially since we're yet to check for things that can derail that dream of a bright future.